With Myanmar rapidly opening up to development, steel is becoming increasingly important to various industries in the country. Steel structures can be seen springing up across Yangon. As such, a Vietnamese steel importer is operating a manufacturing unit in Myanmar. Despite being one of the essential materials for construction, Myanmar relies heavily on imports rather than local production as only 5pc of the consumption is produced locally and the rest 95pc is imported according to the Myanmar Iron and Steel Association. Finished steel products have mainly been imported into the country for decades. 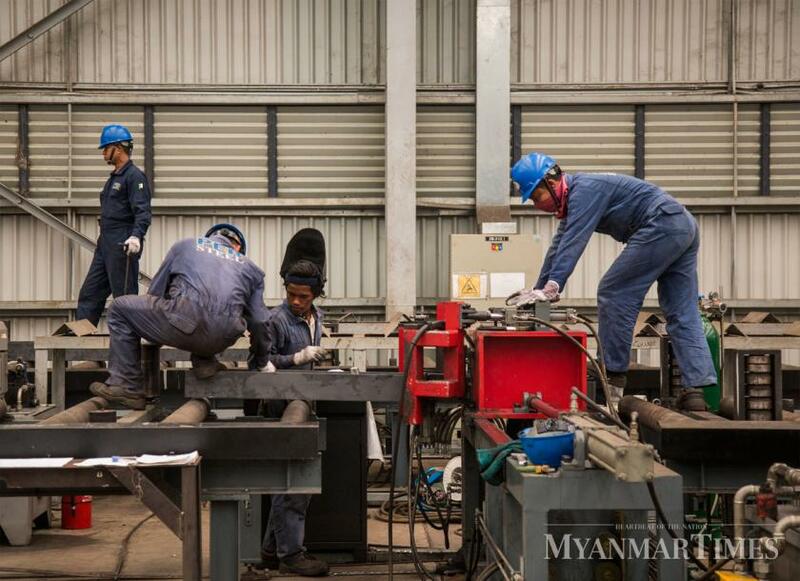 However, starting in 2017, changes have been taking place in the local steel market and steel factories began to be set up in Myanmar with foreign investment. Today, due to market demand, steel is still being imported but local factories are also trying to supply the requirement. At present there is one factory set up with foreign investment in the Thilawa Special Economic Zone specialising in producing steel components for bridge building and structures for pre-engineered buildings. The local arm of Vietnam-based PEB Steel Co is manufacturing finished steel products from imported raw materials at its factory in the SEZ. The company provides a one-stop shop for the designing and making of structures for pre-engineered buildings such as factories and workshops using its own steel structures and the production and assembly of those structures. The company is believed to the first and only steel manufacturer which provides one-stop services for production and assembly of pre-engineered buildings with its own factory in Myanmar. "No one was providing professional services for steel-structured buildings in Myanmar. That is why we decided to establish a factory here," said Nandakumar, general manager of PEB Steel Myanmar. Companies seeking to set up pre-engineered buildings for factories or workshops provide designs to PEB Steel which then manufactures the steel components that are required for the construction of the design. This is then followed by the assembly of the components according to the design. "The challenge is that awareness about pre-engineered buildings is not yet widespread here," said Nandakumar. Steel-structured buildings can broadly be divided into two categories - pre-engineered buildings and to conventional steel buildings. For pre-engineered buildings, steel is cut and assembled according to a design, whereas for conventional buildings, raw steel is just just ordered from manufacturers and the builders utilise the raw material to suit the needs of the design. "PEB`s technology and methods saves around 20pc on construction costs compared to the conventional method. The main thing is to manufacture the steel frames according to the design. Conventional method has to cut the manufactured frames according to the design and so, there is some waste in the process. And conventional steel buildings could take up to months to completed while PEB technology can finish a building within six to eight weeks," he said. The company has already built 50 buildings in Myanmar and also abroad in its one year of operations, Nandakumar said, adding that the bulk of the projects have been in the country. "There are many businesses and factories here and some will be expanded. So, the potential market is good," said Nandakumar. Although there some local makers of steel products, the required steel products for the construction are mostly from foreign countries, so we are mainly competing with imported steel products, he said. "Vietnam and Malaysia don`t encourage too much for importing finished steel products. They support local products. I hope this can be replicated in Myanmar. This would also draw the foreign investors to set up companies to produce steel products," he said. Currently, PEB produces steel products for the local market and also export to ASEAN countries. It produces 25,000 tonnes of steel products a year. PEB Co has six factories in Vietnam.